Drama, Federal Republic of Yugoslavia, 1985, 136 min. Synopsis Tito's break-up with Stalin in 1948 marked the beginning of not only confusing, but also very dangerous years for many hard-core Yugoslav communists. A careless remark about the newspaper cartoon is enough for Mesha to join many arrested unfortunates. His family is now forced to cope with the situation and wait for his release from prison. 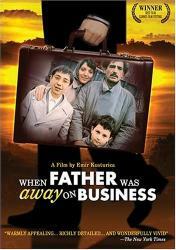 The story is told from the perspective of Malik, his young son who believes the mother's story about father being away on business.